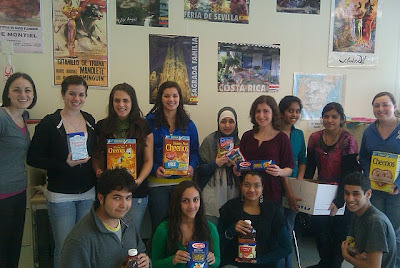 The Spanish club organized a food drive this month for the YWCA Feena House located in Lawrence, MA. The YWCA provides domestic violence and sexual assault support, transitional housing, women's health advocacy services and gender-specific programs for girls. There are many opportunities to help improve the lives of women and young children at the YWCA. The BHS Spanish Club came up with the fundraising idea to coordinate a food drive to help the residents of the Feena House during the holiday season. The students provided cans of soup and beans, boxes of rice and pasta, flour, sugar, cake mix and frosting, muffin mix, apples and oranges, bottles of juice and water, spices and more. On Monday, December 21st the club delivered the boxes of food items to the Feena House.